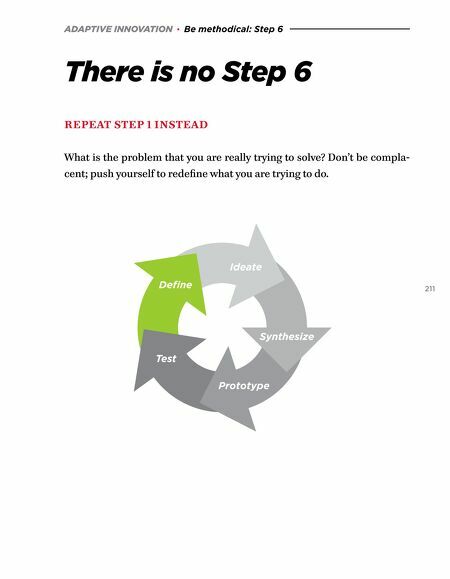 ADAPTIVE INNOVATION · Be methodical: Step 5 Test and optimize SCIENTIFIC METHOD becomes important when you are in uncharted territory, testing new and cutting-edge ideas. 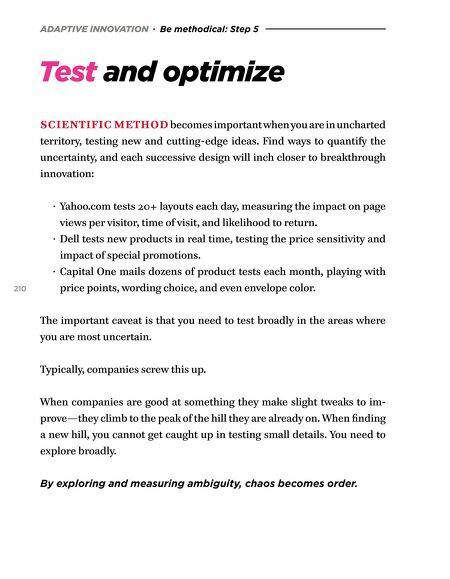 Find ways to quantify the uncertainty, and each successive design will inch closer to breakthrough innovation: · Yahoo.com tests 20+ layouts each day, measuring the impact on page views per visitor, time of visit, and likelihood to return. · Dell tests new products in real time, testing the price sensitivity and impact of special promotions. 210 · Capital One mails dozens of product tests each month, playing with price points, wording choice, and even envelope color. The important caveat is that you need to test broadly in the areas where you are most uncertain. Typically, companies screw this up. When companies are good at something they make slight tweaks to im- prove—they climb to the peak of the hill they are already on. When finding a new hill, you cannot get caught up in testing small details. You need to explore broadly. By exploring and measuring ambiguity, chaos becomes order.